No one wants to get laid off, at least not until you have FU Money. However, one of the benefits of a layoff is being able to roll over your employer sponsored retirement plan, most likely a 401k, into cheaper options or into a more personalized investment plan. That's exactly what I did with my 401k when I was laid off in April 2016. My original plan was to primarily trade options with that capital and while I was fairly successful with it I've decided to change directions and go to a more passively invested portfolio. As I mentioned I made some decent money trading options so it's not like I blew up my account or anything; however, it all comes down to time. 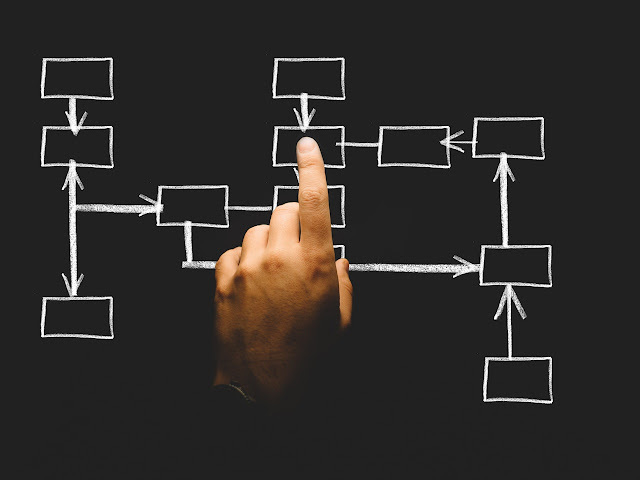 I was spending an inordinate amount of time monitoring and adjusting my positions and looking for new opportunities and the payoff just wasn't as big as I'd have liked. In hindsight I should have done this before, but I wanted to test the waters to see how I did and well at least I learned I can swim. Going forward I'm not going to completely eliminate options although I do want to pare it back to simplify things. I'll still use them to enter positions, via cash secured puts, or selling calls to help reduce the basis on the purchase, but strictly trading options without the underlying being a core holding is going to be reduced significantly in my Rollover IRA. Also, since this capital is within a tax sheltered account I do plan to be a bit more aggressive with locking in some profits whenever I feel that the valuation has strayed too high at least for the non buy and hold forever investments. That's not to say I'm looking to sell something worth $100 for $102, but if it gets to the $120+ area then I'll be looking to exit since there's no tax implications and redeploy the capital into more attractive opportunities. As such I'm re-characterizing that account and will start reporting on new purchases, sales and of course dividends which are my favorite. My Rollover IRA holdings currently stand as follows. 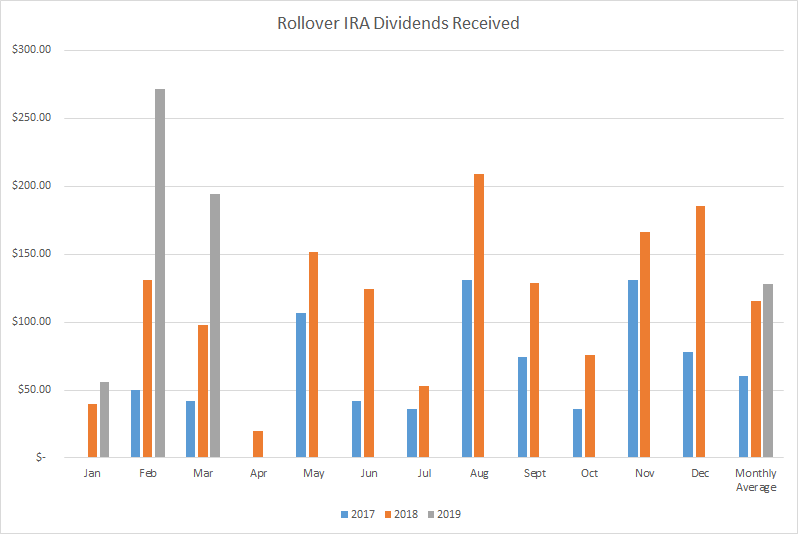 The forward 12-month dividends in my Rollover IRA are $2,178.76. This adds an extra ~$181 to my monthly dividends received which is a nice chunk of additional dividends. However, since it's held within the Rollover IRA and I'm not likely to tap those funds for another 24 or so years there's still plenty of time for compounding to work its magic. Since my plan is to still take a more active approach rather than a pure buy and hold, my dividends will be choppier than my FI Portfolio. That being said the trend should generally be higher most of the time. From the start of 2017 through the middle of March I've received a total of $2,630.23. I received a total of $727 in 2017, $1,382.17 in 2018 and nearly all the way through 1Q 2019 I've received $521.06. I'm pretty excited to be start reporting on purchases that I make within my Rollover IRA especially since that's where the bulk of my investable cash is at the moment. My FI Portfolio's forward 12-month dividends now stand at $6,847.47 with my Folio First at $97.83. My Roth IRA is at $415.21 and my Rollover IRA is at $2,178.76. That puts the grand total at $9,539.27 of forward 12-month dividends across all of my individual investment holdings. That's so interesting PIP. I want to get into options and now you're phasing out of them. Can't argue with making your portfolio more passive. I'm going to try to learn about covered call writing because I think it's a good strategy to get into as a beginner. I've read a lot. I just need to take action and get started. I was doing a lot more than just covered calls and cash secured puts and had ventured into much more complex strategies and into underlying I'm not really wanting to own for the long term. I'm still going to use covered calls and cash secured puts,in the future but the more complex strategies are likely done for the time being because they required a lot more time commitment. Thats the biggest reason for the swap/course adjustment. Options are fun and I think just a simple strategy like the wheel, sell puts til you get shares then calls til call away, on DGI companies should be a decent way to reduce your cost basis. All the best. This will be very interesting to see PIP. In this community, we typically take a buy and hold approach and let each purchase ride. So I'm very curious what it will be like for you to take a more active approach to your portfolio. You have a nice pot to play with and a very strong base of companies already. That's a great way to start this investing strategy off.